An independent report commissioned by Wandsworth Council has confirmed what we saw on television at Clapham Junction: police withdrew from the area for 90 minutes, in effect allowing looters a free hand to smash up shops and take what they wanted. Only eight riot officers were available in the area - nowhere near enough to cope with the level of violence and disorder going on. With requests for back-up being made from 8pm, just after 9pm the borough commander realised that his options were either to send in untrained officers, risking injury or death, or withdrawing altogether. Can we blame the police for withdrawing? Not really. Despite the spread of trouble and rumours building all day, the Met increased the numbers of police on the streets - but by nowhere near enough, and not in the right areas. The report points out that even though trouble in the area was being suggested all over social media on 8th August, there was also talk of rucks in Barnet and Lambeth, neither of which materialised. While police were off the streets, 90 shops and businesses in Clapham Junction were attacked and stuff stolen, including cash from ATMs and tills, electrical equipment, phones and the ubiquituous bloody trainers. Just before 10pm, 75 trained officers arrived at Lavender Hill and were deployed at 10.38pm. 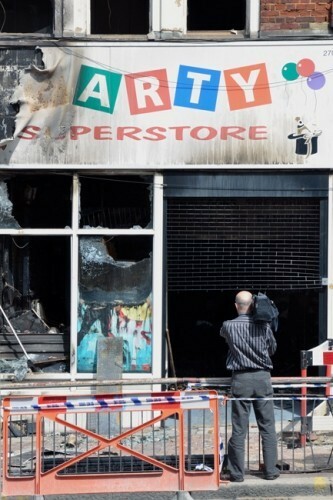 But even they weren't able to stop the Party Superstore being burned down. However, in a piece of good news, the shop re-opens on Saturday. The report suggests Clapham Junction was targeted because it was easy to get to, is close to a number of deprived estates and has an abundance of the types of shop looters were focusing on.